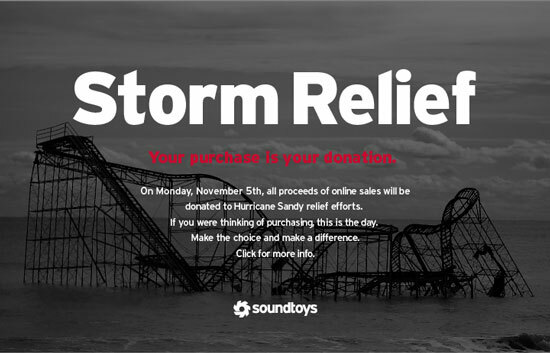 On Monday November 5th 2012, SoundToys will donate one hundred percent of its online sales to help the storm victims of New York and New Jersey. As former residents of New Jersey, and with a great number of friends in both New York and New Jersey, as well as the large music community affected, SoundToys wants to help. If you were thinking about making a SoundToys purchase, consider doing it today, Monday Nov 5th, and help those in need. All proceeds will be donated to Team Rubicon, a rapid relief organization already working in both areas to aid the needy. The organisation employs skilled veterans to assist in all areas of relief and aid. 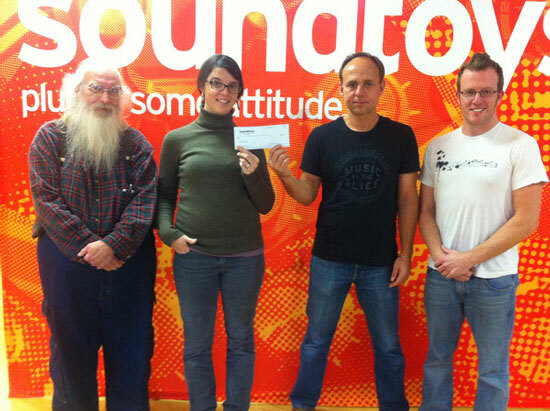 On Thursday November 8th 2012, SoundToys delivered a very large cheque to Team Rubicon’s Super Storm Sandy Relief effort. The total raised by SoundToys customers was $38,384. That’s $37,439 in sales plus $945.00 in direct donations to Team Rubicon. To each and every person who made a purchase or donation SoundToys proudly and humbly issues a sincere “thank you”.